Fad diets come and go, but there's one idea that seems to remain constant: the (misleading) perception that carbs are bad. In fact, open a magazine, watch your favorite romantic comedy, or walk into any gym, and it's highly likely you'll internalize some kind of message regarding carbs and weight. More likely than not, it will have you second-guessing last night's empañadas—no matter how much you enjoyed them. But here's the thing: It shouldn't. True, too much of anything is never a great idea when it comes to feeling your best (and overloading on carbs is no exception), but starch, just like protein and fat, is an essential part of any diet. So why the fearmongering? Of course, it's also imperative that I make a confession here because to a certain extent, I've gone years being one of those people who has actively let society's carb demonization fester within my complicated relationship and approach to food. I've written about my eating disorder before, as have my mom and sister, so I'll spare you the nitty-gritty. What is relevant, however, is that roughly two months ago, I came face-to-face with the realization I had let my eating disorder dictate a general avoidance of carbohydrates, which had a negative manifestation regarding my hormones and period health. Essentially, I hadn't gotten a regular period in years, and while I knew certain unhelpful habits (like calorie counting and carb restriction) weren't helping, I felt stuck. For the most part, I felt normal and nowhere near the dark and scary place anorexia had taken me years before, but I found myself unable to internally motivate myself to actually make the crucial changes I knew I need to make in order to improve my health (even after I was diagnosed with PCOS, making strategic tweaks to my diet even more important). A scary fact about eating disorders and recovery? A health professional can tell you until they're blue in the face what you're doing is having a negative impact on your health, and you'll barely blink. But then came my Sakara Life challenge—a two-week overhaul in which I ate 100% plant-based, which inherently forced me to eat more healthy carbohydrates than I was used to. 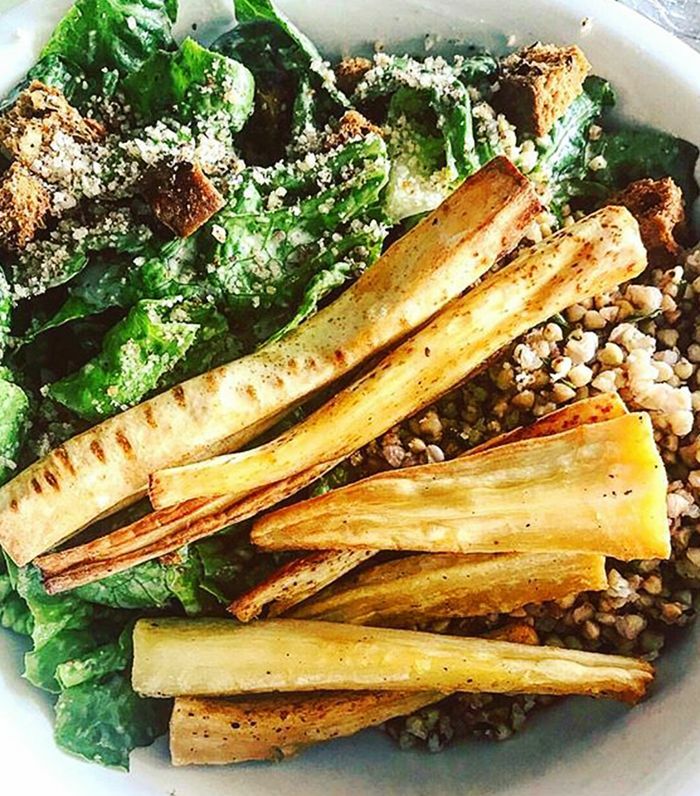 Previously, I would pretty much only eat carbs at lunch (and maybe gorge on fries or pizza once a week while out with friends), but with Sakara, I began eating healthful forms of carbs (like gluten-free oats, quinoa, brown rice, fruit, sweet potatoes, and all the veggies) at every meal. It's also worthwhile to point out that I was blissfully unaware of the calorie count of my Sakara deliveries—one of the brand's most steadfast pillars for forming a healthy and sustainable relationship with food and something that magically seemed to soothe my stress and worry about food almost overnight. But here's the real miracle. Just about two weeks after having converted to a plant-based, carb-rich, and protein- and fat-balanced approach to eating, I got my period. Since then, like clockwork for the first time in years, I've gotten two more. The only difference? I've kicked my previous keto-like diet to the curb and now focus on making sure each meal I eat is balanced, well-portioned, and rich all the macronutrients my body needs to ovulate—protein, healthy fats, and, yes, more carbohydrates. Of course, my newfound discovery left me ravenously curious about the relationship between carbohydrates and our period health, and I recalled the below information I wrote almost one year ago investigating the matter. So applying my new very personal perspective and doing even more research, I've updated and supplemented where necessary. The consensus: Low-carb diets could have some less-than-stellar consequences, especially when it comes to our periods and hormones. Perhaps more disturbing? Little research has been done to see how low-carb diets impact our reproductive health, while a plethora of research has been done to see how these diets will help us lose weight. Curious? Keep reading to learn how carbs can impact our hormone health. When it comes to maintaining a sustainable, healthy, and happy approach to eating, labeling particular food groups in an all-or-nothing fashion (i.e. "good" versus "bad") has the potential to lead to a frustrating and confusing relationship with food. After all, no food is inherently "good" and no food is inherently "bad." It's just food. And while Briden points out a clean, unprocessed, and anti-inflammatory diet is important, it's perhaps just as healthy to enjoy meals out with friends. So what's the deal with the diet world's obsession with carbs? According to Briden, it's definitely a good idea to avoid sugar but not carbs altogether. In her book, Period Repair Manual, Second Edition ($10), Briden makes the point that while sugar is a carb, it doesn't have the same physiological effect on the body as other starchy carbs—an important distinction, as complex carbohydrates are crucial for healthy homeostasis where hormones are concerned (more on this in a minute). While sugar is high in fructose (which is inflammatory), whole-food forms of carbohydrates have more glucose than fructose, which will have a less debilitating impact on insulin levels. In short, as long as you're not overdoing it, carbs can (and should) be a pivotal part of our diets. A quick note on fruit: According to Briden, "A small amount of fructose will not cause inflammation or insulin resistance but instead improves insulin sensitivity and health. A small amount of fructose is less than 25 grams per day, which is about what you'd get from three servings of whole fruit." In other words, please don't fear fruit. As with most things, it's healthy in moderation. To further clarify the relationship between carbohydrates and ovulation/fertility, Nohling explains in this blog post that carbohydrates are a key player in terms of controlling blood sugar and insulin levels. For instance, if blood sugar and/or insulin levels crawl too high, it can throw off reproductive hormone levels, which she says can eventually impact our body's natural ovulation. That said, she explains it's not so much the number of carbohydrates but the way in which our system absorbs and utilizes them. "Just as it is with acne, PCOS, and other conditions, it's the glycemic load (how certain foods affect our blood sugar and insulin), that plays a role in our overall health," Nohling points out. "Eating in a way that keeps blood sugar and insulin (and therefore hormones) regulated isn't an all-or-nothing thing. Instead, it looks like eating 'slow carbs' instead of 'fast carbs' most of the time. Slow carbohydrates contain fiber and are less processed, therefore they are broken down more slowly by the body and enter your bloodstream at a slower rate. Because of this, the body receives manageable amounts of glucose to process over a longer period of time, keeping your blood sugar more stable, decreasing the demand for insulin, and reducing the risk of your blood sugar getting too high." Nohling also goes on to say that people with PCOS (like me) are especially intolerant of low-carb or fast-carb diets. Thus, it makes sense that Sakara's surplus of complex slow carbs did wonders for my hormones and in turn my period health. While low-carb and ketogenic diets are very much en vogue, they could be unhelpful to women in the long run. Briden explains to me that complex carbohydrates have many positive benefits for women—especially when it comes to hormone and period health. In addition to being an essential source of energy, they also support our immune function, thyroid health, nervous system (preventing spikes in cortisol), and contain important soluble fiber, which "feeds your gut bacteria and promotes the healthy metabolism and the detoxification of estrogen," she says. And though low-carb diets have long been hailed as the ultimate solution to weight loss, Briden offers a fresh perspective with female health in mind: "If you follow a low-carb diet in the long term, you might run into problems. A low-carb diet can increase cortisol, slow down thyroid, and cause insomnia, constipation, and hair loss. A low-carb diet can also cause you to eventually lose your period because women need carbohydrates to ovulate." However, some women may need more carbohydrates than others to maintain healthy hormones. When I ask Briden how someone would know whether they need more or less when it comes to their intake, she tells me our period and hair health is the best way to gauge: "If one of my clients tries a low-carb diet and by the three-month mark has lost their period and is shedding more hair than usual, that's a sign they may need more carbs." Briden isn't the only one trying to communicate this line of thinking. In her post "Carb Is Not a Four Letter Word," Nohling makes a similar case for carbs, explaining that restricting carbohydrate essentially puts stress on the body, which in turn increases cortisol. If you exercise, it's all the more important to ensure you're getting an adequate intake (because energy). "Combine a low-carb diet with inadequate sleep, a stressful job and maybe too much exercise, and you'll find yourself at a hormonal frat party," Nohling says in her post. Are Certain Carbs Better Than Others? To keep hormone levels in check, incorporating carbs at certain times of the day and in certain quantities may be key. Briden points out that the standard American diet typically adds up to a whopping 400 grams of carbohydrates per day—far too high, she says. Instead, the optimum range should hit a sweet spot somewhere between 150 grams and 200 grams. This can, of course, fluctuate based on individual needs and lifestyle. In food speak, a day's worth of healthy carbs could look like two potatoes, two pieces of whole fruit, and a small serving of rice paired with healthy fats, protein, and vegetables throughout the day. Briden also notes the relevance of timing: "I do think it's important to keep breakfast lower in carbohydrates, as it extends the night's fast and will help keep insulin levels down at the beginning of your day. However, since carbohydrates are essential for energy and have a calming effect on the nervous system, I recommend them later in the day with lunch and especially at night with dinner." In fact, she says they can be pivotal for satiety and a good night's sleep. Breakfast: Eggs, avocado, and potato cooked in butter paired with unsweetened black coffee or coffee with coconut milk or full-fat milk. Lunch: A large green salad with beets, goat cheese, smoked salmon, and olive oil dressing. On the side, you could try gluten-free crackers and goat cheese, two squares of 85% dark chocolate, and sparkling water. Dinner: A Bolognese meat sauce and gluten-free pasta, green beans with organic butter, a small glass of red wine, and a Mandarin orange. As food for thought, this is in no way is a prescription. Ultimately, it's up to you to do what makes sense for your body and eat the things that help you to feel your best. Additionally, if you've lost your period or experienced any other major changes in your health, it's always a good idea to see your healthcare provider.